Surprise, internet! I'm alive after all. March has completely slipped past me this year but I hope you have all been enjoying it. In case I've not made myself clear enough in the past, I do not like winter and I can already notice it getting cooler as we get deeper into Autumn. I haven't had to deal with winter since mid-2013 but there's no getting out of it this year, so I'll just have to grin and bear it like a normal person. I'm bracing myself by pretending Autumn is a fun thing here like it is in the States and burning my cinnamon-pumpkin-caramel-swirl-pancake-cupcake candles that I picked up at Bath & Body Works, drinking pumpkin spice chai and dreaming of baking pumpkin pies. As for the photo above, if I had enough pumpkin scented products in my life I'd surely do a post about them too but instead this is about roses, so if you associate rose scents with grandmas then you should probably look away now. 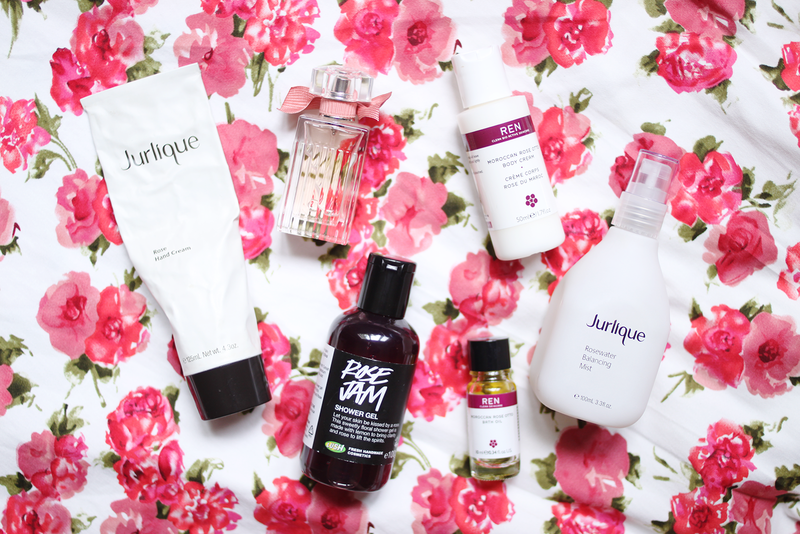 I've mentioned it before but the Jurlique rose fragrance is my favourite rose scent of all time, and their hand cream is also my favourite hand cream. It's rich and creamy, sinks in quickly and keeps my hands super soft. In fact I've almost finished that tube and I've got another waiting to go. Their Rosewater Balancing Mist smells just as wonderful and it's a great refreshing spritz throughout the day or to use as your hydrating toner step in your skincare routine (which is what I do). My lil baby bottle of Roses de Chloe has a bit of a story behind it, which is that I actually bought it on my first day alone on my holiday last year. I flew to Egypt alone but met up with a tour group when I got there, and then flew to Istanbul and met my parents the following day, so I feel like my first day actually alone was the day they left Milan and I stayed behind. On that day I wandered into La Rinascente (the department store just by the Duomo) and the lovely salesgirl convinced me to pick up a bottle by letting me have a Chloe candle with it even though I bought the smallest bottle and that gift with purchase was only meant to be with larger sizes. As for the scent itself it's a lovely light, slightly sweet, powdery rose scent. Not at all heavy or granny-ish, and of course the bottle is lovely, as all the Chloe bottles are. Sadly the Lush Rose Jam Shower Gel is a Christmas only scent that I picked up in their boxing day sales last year, but I'll definitely be getting some more at the end of this year. This is a completely different version of rose to the others I've mentioned - the second ingredient in the shower gel is actually vanilla so it's incredibly sweet and actually smells like a rose jam that you'd eat on toast (which is a real thing I've eaten a whole jar of before and it's glorious). Actually forget toast, I want a cake made with rose jam in the middle and if I come across another jar of rose jam I'm going to make that happen. As for the REN bath oil, this stuff is not cheap and I don't take baths often enough to justify buying the full size, but a little goes a long way. I'd say there's 3 baths worth in that little 10ml bottle, so you don't need a lot for a lovely smelling bath, and my skin actually felt quite nourished afterwards too. The Moroccan Rose Otto Body Cream has the same scent which is a subtle but very true rose scent, and with its rosewater, shea butter and glycerin based formula it's a nice hydrating option with a light, non-greasy texture.